Early CUDA programs had to conform to a flat, bulk parallel programming model. Programs had to perform a sequence of kernel launches, and for best performance each kernel had to expose enough parallelism to efficiently use the GPU. For applications consisting of “parallel for” loops the bulk parallel model is not too limiting, but some parallel patterns—such as nested parallelism—cannot be expressed so easily. Nested parallelism arises naturally in many applications, such as those using adaptive grids, which are often used in real-world applications to reduce computational complexity while capturing the relevant level of detail. Flat, bulk parallel applications have to use either a fine grid, and do unwanted computations, or use a coarse grid and lose finer details. 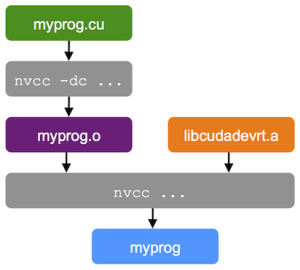 CUDA 5.0 introduced Dynamic Parallelism, which makes it possible to launch kernels from threads running on the device; threads can launch more threads. An application can launch a coarse-grained kernel which in turn launches finer-grained kernels to do work where needed. This avoids unwanted computations while capturing all interesting details, as Figure 1 shows. Figure 1: A fluid simulation that uses adaptive mesh refinement performs work only where needed. algorithms where work is naturally split into independent batches, where each batch involves complex parallel processing but cannot fully use a single GPU. Case Study: PANDA – how Dynamic Parallelism made it easier and more efficient to implement Triplet Finder, an online track reconstruction algorithm for the high-energy physics PANDA experiment, which is part of the Facility for Antiproton and Ion Research in Europe (FAIR). The interior of Figure 2 (the black part), is the Mandelbrot Set. Figure 2: The Mandelbrot Set. 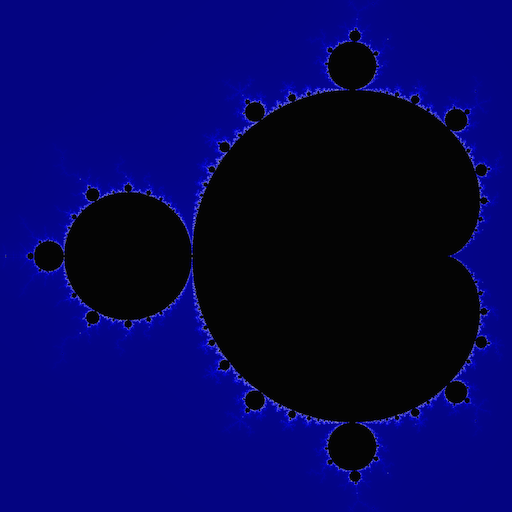 The most common algorithm used to compute the Mandelbrot set is the “escape time algorithm”. 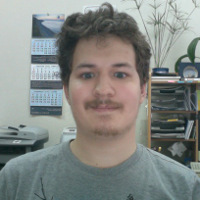 For each pixel in the image, the escape time algorithm computes the value dwell, which is the number of iterations it takes to decide whether the point belongs to the set. In each iteration (up to a predefined maximum), the algorithm modifies the point according to the Mandelbrot set equations and checked to see whether it “escapes” outside a circle of radius 2 centered at point (0, 0). We compute the dwell for a single pixel using the following code. The value of dwell determines whether the point is in the set. If dwell equals MAX_DWELL, the point belongs to the set, and is usually colored black. If dwell is less than MAX_DWELL, the point does not belong to the set. We use the dwell value to color the pixel. If the point does not belong to the set, lower dwell values correspond to darker colors. Generally, the nearer the point is to the Mandelbrot set, the higher its value of dwell. This is why in most Mandelbrot set images the region immediately outside the set is bright, as in Figure 2. A straightforward way to compute Mandelbrot set images on the GPU uses a kernel in which each thread computes the dwell of its pixel, and then colors each pixel according to its dwell. For simplicity, we omit the coloring code, and concentrate on computing dwell in the following kernel code. This kernel runs quickly on the GPU; it can compute a 4096×4096 image with MAX_DWELL of 512 in just over 40 ms on an NVIDIA Kepler K20X accelerator. However, under closer examination, we can see that such an algorithm wastes a lot of computational resources. There are large regions inside the set that could simply be colored black; note that since MAX_DWELL iterations are performed for every black pixel, this is where the algorithm spends most of the computation time. There are also large regions of constant but low dwell outside the Mandelbrot set. In general, the only areas where we need high-resolution computation are along the fractal boundary of the set. We can exploit the large regions of uniform dwell using the hierarchical Mariani-Silver algorithm to focus computation where it is most needed. 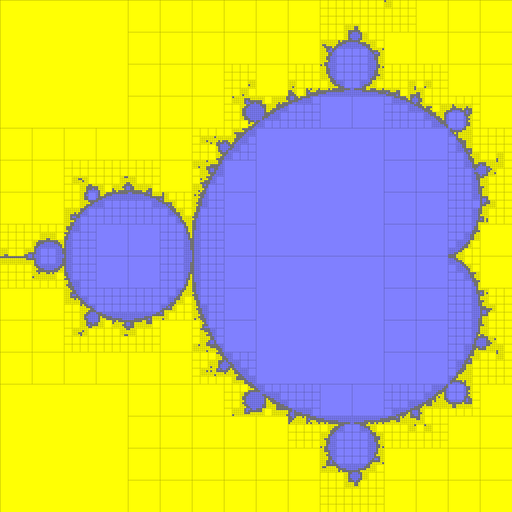 This algorithm relies on the fact that the Mandelbrot set is connected: there is a path between any two points belonging to the set. Thus, if there is a region (of any shape) whose border is completely within the Mandelbrot set, the entire region belongs to the Mandelbrot set. More generally, if the border of the region has a certain constant dwell, then every pixel in the region has the same dwell. So, if dwell is uniform, it is enough to evaluate it on the border, saving computation. The Mariani-Silver algorithm combines this principle with recursive subdivision of regions with non-constant dwell, as described by the following pseudocode, and shown in Figure 3. Figure 3: The Mariani-Silver Algorithm recursively subdivides the Mandelbrot set. This algorithm is a great fit for implementation with CUDA Dynamic Parallelism. Each call to the mariani_silver pseudocode routine maps to one thread block of the mandelbrot_block_k kernel. The threads of the block use a parallel reduction to determine whether border pixels all have the same dwell. Provided that we launch enough thread blocks initially, this won’t decrease the amount of parallelism available to the GPU. Thread zero in each block then decides whether to fill the region, further subdivide it, or to evaluate the dwell for every pixel of the rectangle. In order to implement the Mariani-Silver algorithm with Dynamic Parallelism, we need to launch kernels from threads running on the device. This is simple because device-side kernel launches use the same syntax as launches from the host. As on the host, device kernel launch is asynchronous, meaning that control returns to the launching thread immediately after launch, (likely) before the kernel finishes. Successful execution of a kernel launch merely means that the kernel is queued; it may begin executing immediately, or it may execute later when resources become available. Dynamic Parallelism uses the CUDA Device Runtime library (cudadevrt), a subset of CUDA Runtime API callable from device code. As on the host, all API functions return an error code, and the same best practice applies: check for errors after each API call. On CUDA versions before 6.0, device-side kernel launches may fail due to the kernel launch queue being full. So it’s very important to check for errors after each kernel launch. To avoid writing lots of boilerplate code, we use the following macro to check errors. It checks the return code of a CUDA call, and, if an error has occurred, it prints the error code and location and terminates the kernel. The information printed is useful for debugging (See How to Query Device Properties and Handle Errors in CUDA C/C++). We wrap device CUDA calls with cucheck_err as in the following example. Now that we know how to launch kernels and check errors in device code, we can implement the Mariani-Silver with Dynamic Parallelism. 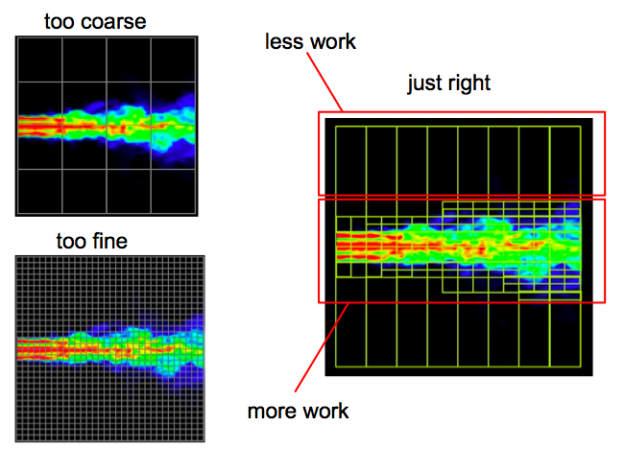 We use the following comparison code in a parallel reduction to determine whether border pixels have the same dwell. The following kernel implements the Mariani-Silver algorithm with Dynamic Parallelism. mandelbrot_block_k kernel uses the following functions and kernels. border_dwell: a function to check whether the dwell value is the same along the border of the current region; it performs a parallel reduction within a thread block. mandelbrot_pixel_k: the same per-pixel kernel we used for our first implementation, but applied only within a specific image rectangle. The complete code for these kernels and full code for rendering the Mandelbrot set image using the Mariani-Silver algorithm is available on Github. Figure 4: The Separate Compilation and Linking Process for Dynamic Parallelism. To compile your source code into an object file, you need to specify the -c (--compile) option, and you need to specify -rdc=true (--relocatable-device-code=true) to generate relocatable device code, required for later linking. You can shorten this to -dc (--device -c), which is equivalent to combining the two options above. To link the object file with a library, use the -l option with the library, in our case, -lcudadevrt. Figure 4 illustrates the compilation process. Note that the -rdc=true option is not necessary in this case, because nvcc generates an executable that does not need any further linking. You can also compile and link in a single step, in which case you should specify the -rdc=true option. Figure 5 compares the performance of the brute force per-pixel and Mariani-Silver algorithms for generating the Mandelbrot set when run on an NVIDIA Kepler K20X GPU at standard application clocks. Figure 5: Performance comparison of a per-pixel Mandelbrot kernel and the recursive Mariani-Silver algorithm using CUDA Dynamic Parallelism; the number above the bars indicates the speedup achieved by using dynamic parallelism. Using dynamic parallelism always leads to a performance improvement in this application. The speed up is higher at higher resolutions and higher MAX_DWELL. This makes sense, because larger MAX_DWELL means more computations we can avoid at each pixel, and higher resolution means larger regions, in terms of pixel count, where we can avoid computations. The overall speedup from using dynamic parallelism varies from 1.3x to almost 6x. 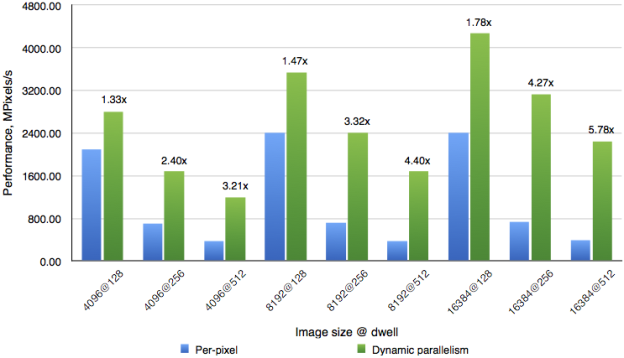 Also note that using dynamic parallelism decreases the cost of increasing MAX_DWELL to improve the accuracy of the image. While the performance of the per-pixel version drops by 6x when increasing dwell from 128 to 512, the drop is only 2x for the Dynamic Parallelism algorithm. Using a hierarchical adaptive algorithm with Dynamic Parallelism to compute the Mandelbrot set image results in a significant performance improvement compared to a straightforward per-pixel algorithm. You can use Dynamic Parallelism in a similar way to accelerate any adaptive algorithm, such as solvers with adaptive grids. We’ll continue this series soon with a look at more advanced Dynamic Parallelism principles, such as synchronization and device-side streams, before concluding with a real-world case study study in the third part of this series. Andy Adinets got his Diploma (“specialist”) degree in Computer Science in 2006 from Lomonosov Moscow State University, and his Ph.D. in Computer Science (“candidate of physical and mathematical sciences") in 2009, also from MSU. From end of November 2012 to end of March 2015, he worked as a researcher at NVIDIA application lab at Jülich Supercomputing Centre. Since July 2017, he has been working as an AI Developer Technology engineer at NVIDIA in Munich, Germany. His research interests include GPU programming, algorithm design for many-core architectures, high-performance computing and machine learning.